Norma's post about The Dulaan Project reminded me that I never posted a picture of the items I sent last month. I will admit, right up front, that none of them were knit in the past year, and none of them were knit expressly for this project. But I think that all of them will help to keep some folks warm. 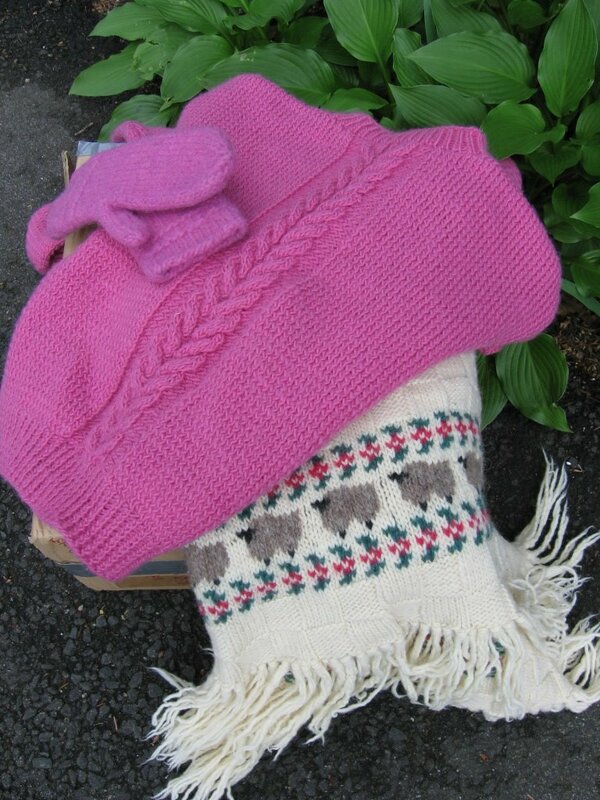 The bright pink sweater is the first sweater that I ever knit. In fact, other than a small learning swatch, it's the first thing I ever knit! I remember picking out that beautiful local Maine wool, dyed in a color to defy the drab coastal winter day. I remember how proud I was when I finished it, in February of 1988. So why am I giving it away? Well. First of all, I didn't use a pattern for it, as the person who taught me to knit was a firm believer in creating your own designs. And that's great--except that she didn't know much about planning for ease. So, I used my bust measurements to draft the pattern, without adding any additional width; and the resulting sweater was a tad snug. Wearable, but snug. Also, at that time I twisted Every Single Stitch. Twisted stitches can be a nice design element , but all over an entire garment is a bit much. The blanket with the cute sheep was made for me by a friend when my first child was born. She was a generous friend, but a childless one; and she did not think about the fact that machine washable, softer wool might have been more appropriate for a baby blanket. While beautiful, this blanket is a bit scratchy, and it would make a better lap blanket than a baby wrap. That said, it could provide a nice outer layer for a baby in a very cold climate, and I hope that it will be well used in Mongolia. The child-sized mittens are basic felted ones that I made a few years ago as an experiment. I had stashed them away until my girls were big enough to use them, but really--how senseless is that? I can easily make new pairs for them--or they can make their own! So off they go. Next year I plan to make time to knit at least one item specifically for this great project. Ryan, you rock!